Now that you have made the decision to buy an adjustable weight bench, congratulations! But there is so much more you need to know, and it can seem overwhelming. That’s why we have created this buyer’s guide. 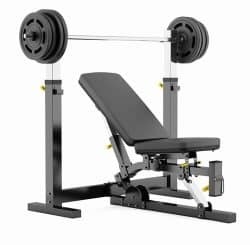 We have reviewed 5 different adjustable weight benches and included some tips you should be aware of. You will be able to choose between our top pick and a few other benches, and you will learn what you need to look for in your ideal bench. What Makes a Good Adjustable Weight Bench? Our number 1 choice is from Fitness Reality, a fitness equipment manufacturer for real people by real people. They designed this bench to help you get an intense workout wherever you are, either in the gym or at home. It offers a unique way for you to blast through your workout and eventually reach all your fitness goals. The bench was designed with versatility and convenience in mind. All its features are proof of this, making the bench ideal for most home gyms. It can also be used in commercial gyms thanks to the versatility of the bench. It has a 1,500-lb. capacity with a 2x3 inch tubular steel frame construction. As well as 2.5-inch-thick commercial grade foam in the seat and back rest, ensuring that you get the most comfort out of your workout. The upholstery is soft and durable stitched vinyl and includes a back and head rest as well as a comfortable supportive seat. The multi-level backrest and seat adjustment ranges from -15° to 85° with seven options for a smooth transition at your fingertips. The bench also features convenient independent adjustment and is suitable for people up to 6’4’’. The preacher curl and leg developer attachment has 180 lbs. of real weight plate capacity and 6 height adjustment. You will be able to work out every inch of your body to degrees you never thought possible, allowing you to gain in no time at all. It also has a detachable leg lockdown for crunches, sit-ups, etc. You also have the option of choosing to add the fitness reality power cage and squat rack. It is also very easy to move this bench because it features a convenient fold-up design with industrial strength wheels so that you can maneuver it into storage with ease. This means that it does not need to take up a lot of space all the time. Some assembly is required. Before you go and buy the bench, there are a few things that you need to know. As with most products, there are a few minor issues that will translate into slight inconveniences. These are not necessarily deal breakers, but it is useful to have this knowledge so that you can be prepared. The packaging could be a little bit more convenient. When unpacking, it feels like you must wrestle through an Indiana Jones level of obstacles just to get the product out of the box. The bench is a little tall. It does not really accommodate shorter people. If you're a bit shorter, it feels like you must use your tip toes to balance yourself when using this piece of equipment, which is not ideal and does not feel safe. A height adjustment would be a lot of help in this department. Our next bench is brought to us by Rep Fitness. This brand has a good reputation for turning out quality fitness equipment. It takes pride in being a real manufacturer instead of an ordinary distributor or importer. They have an excellent team of experts that are dedicated to helping you. This bench is more cost effective than our top pick, but it is still a decent bench that deserves your attention and beats a lot of other benches on the market. The bench is made from heavy-duty steel and can handle up to 1,000 lbs. The bench can be used with dumbbells, smith machine, cage or a power rack. It is 54 x 26 x 17.5 inches. It features 7 ladder positions and can go between -20° incline and 85°. It also has 4 different seat position adjustments. The rollers are covered with vinyl to keep your legs locked in place during any decline workouts. The vinyl cover also makes it very easy to clean up. The frame has a 10-year warranty while the pads have a 30-day warranty. This is a standard warranty which inspires confidence in the product. The front feet are a little thin, meaning that the bench tends to lean forward with you which can feel disconcerting at times. The seat portion is also a little difficult to assemble which can lead to a level of frustration. The ankle catch has been unfortunately placed which can lead to a little pain in your shins, and if you’re not careful you can bruise your shin while doing decline sit-ups. Marcy Fitness has been around for over 50 years and has cultivated a stellar reputation in the fitness market. The Adjustable Utility Bench is advertised as being able to help you with a full-body workout. In a home gym, you need equipment that can perform a variety of functions to save space. This bench would be convenient for most home gym setups thanks to its easy setup and transport. When you are done with the machine you just fold it up and roll it away. The utility bench has wonderful boxed upholstery to help with comfort and put you at ease while you are working out. The bench is adaptable and can be attached to most types of equipment. This bench is solid and won’t make you feel like it is about to collapse underneath you. The seat can be adjusted into 3 different positions and allows for a variety of different exercises. CAP Barbell is another one of those fitness manufacturers that know exactly what they are doing. They have been manufacturing quality gym equipment at budget prices for a long time now and have earned themselves a trustworthy reputation. You can get your workout done on their equipment without having to breaking the bank. The bench has been constructed from high-quality steel, allowing the bench to be strong and sturdy. The upholstery is as comfortable as you could expect, and the adjustable bench does all that is required from it. You can use it alone with barbells or resistance bands and use it for different exercises. You can also choose to include the power cage also by the same brand. Titan Fitness has brought us a wide range of fitness equipment and deserves the recognition that they get in the market. Their products are all affordable and were designed with the home fitness enthusiast in mind. This bench has a comfortable adjustable back rest and seat. It is supported by a rigid steel base that makes the entire bench feel strong and sturdy. The bench features conveniently placed bolt holes in case you would like to mount it permanently, giving it a little more sturdiness and support. The bench can handle up to 650 lbs., making it perfect for beginning users who do not want to bulk up too much. An adjustable weight bench is a great fit for all your fitness needs. It will allow you to exercise with greater efficiency, and you will be gaining in no time at all. Of course, you want to get the best bench for your money, there are things you need to look out for when buying your bench. An adjustable bench has a basic frame with one of two adjustment mechanisms – steps or pop-ins. They are equipped for simple dumbbell routine but come with levels of adjustments so that you can do as many variations of exercises as possible. They are not built for heavier compound exercise, but some models are equipped with handles and wheels for easier movement. When buying your ideal bench, you will need to look at the same factors as the flat bench, and a few others. You need to look at stability. A stable bench is a safe bench. Look for a heavier steel frame, which might be a little difficult to move around. A light bench will be easy to move around but the disadvantage is that it will jump around while you exercise and will not be stable or safe. Next up is comfort. A proper bench will have 2-3 inches of high density foam and a boxed upholstery. Anything less will not support your body while you exercise and will be very uncomfortable. If you want your bench to last for a while, you need to make sure that the steel frame is protected against rust – usually this means powder-coating, though some will simply be painted. Powder-coating is better, as it is more resistant to minor damage. This will make sure that your bench withstands daily wear and tear. When it comes to the adjustable hardware, make sure that all the components are made from high-quality steel which will mean that you do not have to replace nuts and bolts every month. There is not a major difference between steps and pop-ins; it is a matter of personal preference. Try out a few different machines to see what you are comfortable with. A good adjustable weight bench will have a range between -10° and 85°+. Anything more than that is not bad, but anything less than that will limit your range as you progress. If you keep these things in mind, you will find a wide variety of quality benches to choose from while eliminating the lesser benches that will eventually hurt you. The biggest safety concern when it comes to benches is the sturdiness of you weight bench. A light bench will wobble underneath you which is very dangerous. Always make sure that you assemble the bench according to the featured instructions. You should also pay careful attention to the adjustable settings. The equipment needs to fit properly; if the settings come loose while you exercise it would cause a lot of damage. Another factor to consider would be where you place your bench. If the floor is slippery, make sure that you have rubber for the ends of your frame. A simple solution of soap and water will nicely clean your frame, and spray soaps should not be a problem. The adjustable settings might need regular checks to make sure that they still slot in smoothly. Use a dust cloth to remove any dirt, and regular grease application should ensure that your settings adjust smoothly. For the rubber and upholstery, you will find that most brands include a convenient cleaning guide for these parts along with the bench. Since each brand uses different materials, it would be hard to give a general rule when it comes to the upholstery. Barbell or Dumbbell: Which Is The Best?